Have you ever gone to a mall, a festival or other big event and then forgot where you parked your car? You might have parked on the street and walked several blocks without even looking at a street sign. It can be pretty embarrassing…. But good news…. there is a feature in the iPhone Maps app that will automatically mark the location of your parked car on a map. It can be a life saver. The only setup is that you are using Bluetooth in your car to do hands-free calling or for listening to music or podcasts. 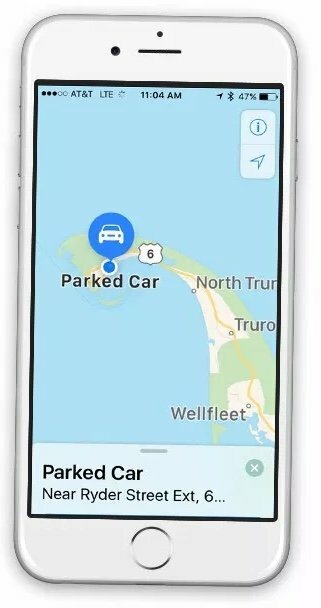 Once you are using your car’s Bluetooth function to listen to music or make hands-free calls, the Apple Maps program will automatically mark the location your car when Bluetooth is disconnected. You can launch your iPhone Maps app and find your parked car as shown on the map below. Smart Tip: From the map picture (see to the right), you may not find the map location useful if you are looking at the mall’s parking lot or parking at an event. Consider switching to the satellite (picture) view in order to align your car’s location with parking rows or other visible landmarks in the lot. In the Maps app, tap the Information (Circle I) icon and choose Satellite. Smart Tip: If you park in a large parking ramp, the Parked Car location is not able to show you the the floor where you are parked. This is a perfect place to snap a quick picture of a reminder like the sign that displays your floor number or other identification. If you are using Bluetooth in your car, the location of your parked car will be displayed on your Apple Maps. It is a convenient way to mark the location of your car. This Nugget is fully presented in a Senior Tech Recipes. Membership in the Senior Tech Club may be required. Membership in the Senior Tech Club provides complete access to Senior Tech Club recipes and community. Stay connected and engaged by mastering your iPhone and iPad with the help of the Club. Learn more about the Senior Tech Club by signing up for a Trial membership. Thanks for your support of the Senior Tech Club!